Heat oven to 350°F. Bake rolls as directed on bag; place on cooling rack. Cool completely, about 20 minutes. Spray 1-quart casserole with cooking spray. Cut each baked roll into 8 pieces, place in casserole. In medium bowl, beat milk, sugar, butter, almond extract and egg with wire whisk until well blended. Pour milk mixture over roll pieces. Push roll pieces into milk mixture; stir in cherries and chocolate chips. Let stand 5 minutes. Bake 25 to 30 minutes or until set (a very small area in the center, less than 1 inch in diameter, may look moist). Drizzle top of warm pudding or individual servings with icing from packet. 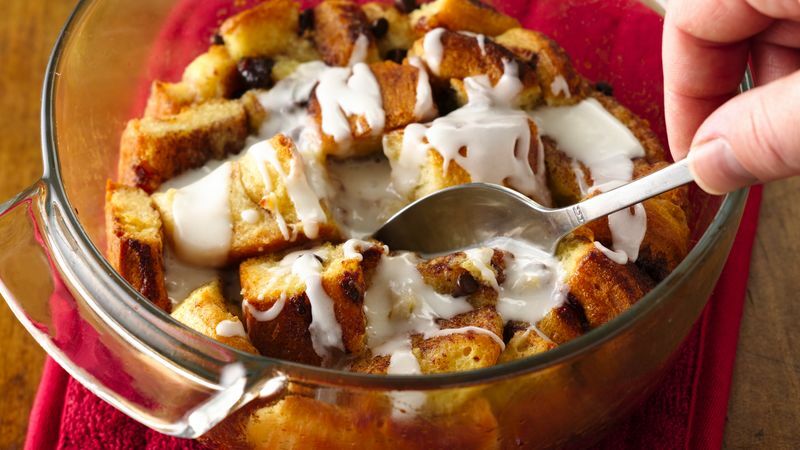 Try topping this bread pudding with a chocolate glaze! In small microwavable bowl, microwave contents from 1 icing packet and 1 1/2 teaspoons miniature semisweet chocolate chips uncovered on High 15 to 30 seconds or until mixture can be stirred smooth.